COLOR(S):Brindle, blue, or wheaten, all shades of these colors. 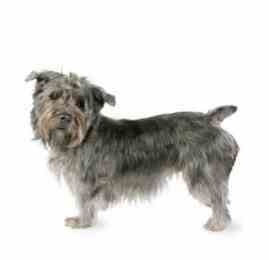 The Glen of Imaal Terrier is a scrappy, medium sized terrier who is mainly used for working. Known as a tough little Irish dog with great strength, this breed is longer than it is tall and has a double coat of medium length, which should give the appearance of great substance for their size. They also have a very distinctive head with half-pricked ears, along with bowed forequarters with turned out feet. Glen of Imaal Terriers have a "shaggy dog" appearance to them, and only require a quick brush to maintain this look. They are sturdy, stoic and brave. Glen of Imaal Terriers are known for being feisty dogs in the past, but have been bred down to have an affectionate and kind disposition. They are loyal, happy, and good with children and most other pets, but are not willing to back down from a fight. It is said that the only way to release the Glen of Imaal Terrier from his grip is to "choke" him out of it, pressing the fingers on the throat until he releases. They are excellent ratters and were once mainly used to hunt badger, a vicious underground creature. Glen of Imaal Terriers are a hardy, spirited dog that is gentle and docile toward its family. Less energetic than other terriers and highly trainable, the Glen of Imaal Terrier is ideal for someone longing for a loving companion who can be useful around the house as well. Has great courage when called upon and can be very feisty with badgers, foxes and vermin, but otherwise the Glen of Imaal Terrier is fairly calm and gentle. They are rather docile terriers, more calm than regular terriers. They are affectionate and loyal to their owners, and do well with children. Because of a "no barking" rule in the early days of showing the dogs, some do not bark often. They are usually quiet and very playful. They are hardy, spirited and courageous. Glen of Imaal Terriers are intelligent, highly trainable and easy to get along with. Some are dog aggressive, but they are generally gentle. Breed is double coated, harsh-textured, weather-resistant outer coat is a of medium length. The undercoat is soft. Regular brushing, strip the coat once or twice a year. Regularly plucking of hair in the ear canals. Glen of Imaal Terriers have a tendency to overeat. Other health concerns include skin defects, PRA (Progressive Retinal Atrophy) and allergies. Daily exercise. Glen of Imaal Terriers love to swim, but are not the best swimmers. Will respond to positive praising. They make excellent candidates for obedience training. They are known to be very intelligent and to learn quickly.